After 17 years, Cannon Fodder is back! The new Cannon Fodder 3 game is a direct sequel to the 90's Amiga classic. This time, we're treated to true 3D graphics but still the same cute gameplay. Those of us who grew up in the 90's will remember that Cannon Fodder was one of the best games for the Amiga. Cute graphics, simple but effective gameplay and a funny soundtrack all combined to make a superb game. Forget that old jeep jump this game comes with 8 different controllable machinery. There are boats, planes, helicopters and even bosses. 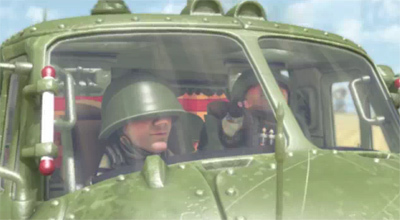 Judging by the gameplay videos, the tanks and helicopter fighting looks cool. Not sure about the heavy music though, sounds too much like they're trying to copy Red Alert and Frank Klepacki's master piece. More guns are something that the original was missing so that's going to be great to try. Take a look at this gameplay video and see some of the new guns and vehicles in action.. Caution: You might want to turn the volume down..
Is Cannon Fodder 3 any good?